This unique women's ring features both princess and baguette Diamonds alternating to highlight their brilliance and fire. Along each side of the channel set Diamonds are 32 tall, dazzling prong set solitaires. 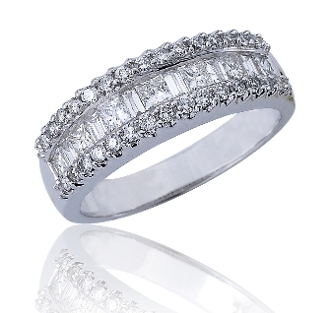 All Diamonds are set in solid 14 Karat white gold. For added appeal personalize your item, select our Engrave option and indicate size needed when adding to Cart.